Price is not the only thing that matters when it comes to buying your new Quantum Optional Shower Leg, great customer service is priceless! By adding the Quantum Q100L Shower Leg attachment, you can convert your Q100 bath chair into a shower chair that is freestanding and suited for roll-in shower use. 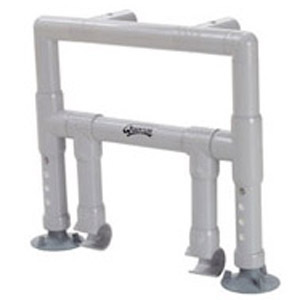 The Q100L Shower Leg attachment offers additional support to the transfer surface while the unit is not in use in a tub, and provides extra support and stability to the bath chair by broadening the stance and adding two more sure-grip feet. Attaching and removing the Quantum Optional Shower Leg is conveniently simple and performed with no tools needed.